I have not been doing too much reading lately. Combine my lack of traveling and new found car sickness = no new books read. Anyways, I read By The Time You Read This by Lola Jaye on my last work trip. By The Time You Read This follows 12 year old Lois through her life after her father's death when she was 5 years old. Her father, knowing he only had 6 months to live, wrote The Manual - advice for hie daughter to live by, laugh at and follow from 12 to 30. 3. No peeping at the next entry unless it's your birthday! When Lois Bates is handed the manual, she can barely bring herself to read it as the pain of losing her dad is still so raw. Yet soon his advice is guiding her through every stange of her life - from first love and relationships to her career. 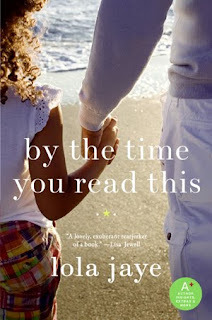 The manual can never be a substitute for having her dad back, but through his words Lois learns to start living again, and discovers that happiness is waiting around the corner..."
Overall, this was a good book. I thought I would be more emotional when reading it but the manual was not as in depth as I first imagined. A fairly quick read that rates 3.5 out of 5 in by book.